We had this cow marked as "Best in Sale" in the 2018 HV Stockyards Sale catalog. Still feels like a dream that we were able to bring her home with us! 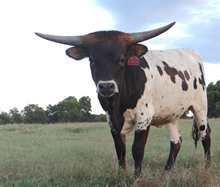 Many thanks to Bill and Elizabeth Hudson for consigning this elite female. Thank you Bill and Elisabeth Hudson for purchasing this beautiful heifer. She is the first Cowboy Tuff Chex heifer to be sold at a public auction! Tip to Tip 86.0000 04/06/2019 Dalgood's Prediction 90.93"